Social networking sites, especially FaceBook, are now an ingrained part of most all of our lives today. I use FaceBook every day and love it – for the most part. I use it for keeping up with family and friends, events, and ministry so I’m checking in multiple times every day. As is true with all things, there is good and bad with any social media/networking site/tool but I’ve seen a growing trend recently that really disturbs me: professing Christians sharing photos, pages, and such that are anything but Christ-like. You may not realize it but when you “like” or “share” something all of the associated text shows up in your news feed. Many times the commentary or page name that the post originated at/from contains very worldly text, often including profanity of some form and degree. When Christian people do this, aware or not, they are, as the Apostle Paul wrote in the Book of Romans I believe, blaspheming the name of God among the unsaved that read it. And you are most certainly hurting your own witness among those you have most influence over/ toward. 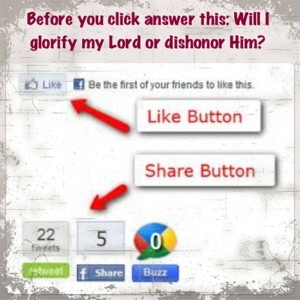 Think before you share or like something “Am I honoring and praising God with this? Or does it reflect poorly on Him and myself?”. If you must share it, edit it to be at G-rated at least or save the image and share it as your own post. Better yet, as the old saying goes “when in doubt, leave it out” and just skip it altogether. As the day comes to a close, a day that most of us in the United States have celebrated on some form, freedom is likely still very much on our minds. We are truly blessed with a tremendous amount of freedom in this country, freedom that has cost many lives and much heartache in our 230+ year history. Our freedom and liberty is something we ought not take lightly. But I expect that, from time to time, we all do. As great a freedom as we have as US citizens, those that have surrendered their lives to Christ Jesus have freedom and liberty that is far greater. Having our citizenship not of this world, we are a part of the greatest, most magnificent Kingdom that ever has or ever will exist: the Kingdom of God. This citizenship and these freedoms and liberties also came at a cost, a very high one. A cost so great that none of us could have ever paid it. But, praise God, the King of King’s paid it all for us. And we who have been set free by “the Son are free indeed”. Have you praised the Lord for your independence today?